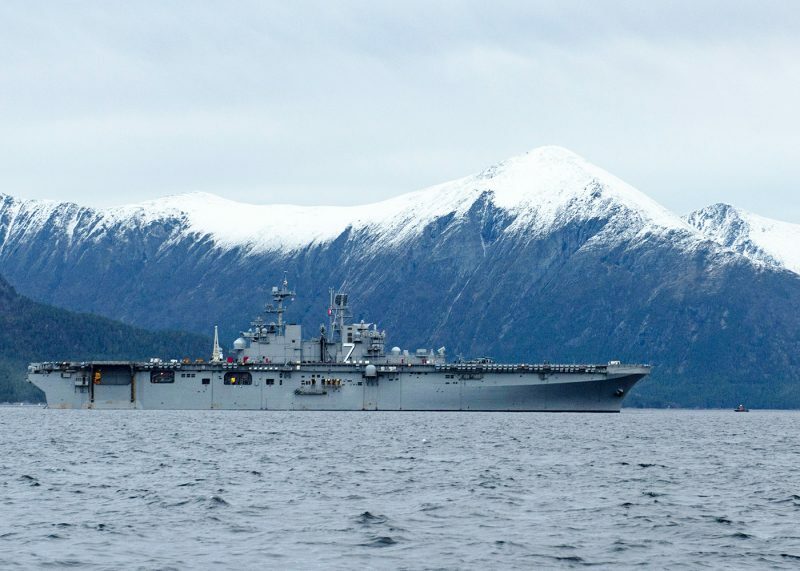 The amphibious assault carrier USS Iwo Jima in the Alvund Fjord during exercise Trident Juncture 2018, a major display of NATO naval forces projecting power in the Arctic. Photo: US Navy. President Vladimir Putin has a strategy. It is one in which he wages war by hybrid and asymmetric means. It is hybrid because he is employing a mix of political and conventional warfare, irregular warfare and cyber-warfare along with other methods, such as fake news and interference in elections. he Salisbury poisonings and shooting down a civilian airliner – and then suavely denying such incidents in order to avoid responsibility and retribution. Putin will be around for at least another decade and is clearly adept at Maskirovka, a topic Odin has touched on before. It is a strategy of denial and deception – of distraction – at a time when Western governments are in disarray and so have no unified strategy to deal with Putin’s Russia. Under Maskirovka, the challenges and threats to NATO and to Europe have become more complex but less easily defined. Meanwhile, at the last NATO summit (in July 2018) President Trump made it clear (again) that he remains unhappy with many of its members. The next NATO summit will be held in London in December, when the 70th birthday of the Alliance will be celebrated and Trump can be again be expected to let off some fireworks when he attends. NATO has been the foundation of European defence and security since the late 1940s and recent tension between its biggest underwriter (the USA) and other Alliance nations has, not for the first time, been about money. Even though the NATO allies have agreed on a target of 2 per cent minimum of GDP on defence spending each by 2024, it is likely that few, if any, will ever reach this target. Trump has suggested that it will not be enough – the transactional US president wants 4 per cent of GDP. Instead, in Europe MEPs have voted for a €13bn European Defence Fund (EDF), intended to encourage cooperation in developing the technologies and equipment needed for common European defence and security challenges, thus strengthening the idea of some sort of combined European defence force. UK Defence Secretary Gavin Williamson has rejected the idea that the UK could participate in this European initiative and reaffirmed that NATO remains the cornerstone of the UK’s defence strategy. Meanwhile, French President Emmanuel Macron has urged creation of what he calls a true European army, suggesting that somehow this will prevent Europe from becoming “a plaything of great powers”. He has advocated permanent structured cooperation on defence – to be known as PESCO. The French have had a dysfunctional relationship with NATO for many decades. France led several attempts – even during the Cold War – to set up competing defence ideas within what was then the Western European Union (WEU). However, the French have at least participated in NATO, even if reluctant to content themselves with that alone. It is clear that Europe is incapable of acting unilaterally, as is shown by Russia’s recent provocation in the Kerch Strait at the entrance to the Sea of Azov, in forcibly detaining three Ukrainian naval vessels (and spiriting their crews away for what are feared to be looming show trials). NATO was strong in its condemnation – Europe prevaricated. Even though the Sea of Azov is internal waters shared by Russia and Ukraine, Moscow placed the blame for the dispute on the Ukraine and described the November 2018 incident as a violation of international law. It’s clear that Putin’s aggressive strategy will not be satisfied until he has fully annexed the Donbass region and spread his forces westwards along the coast of the Black Sea. 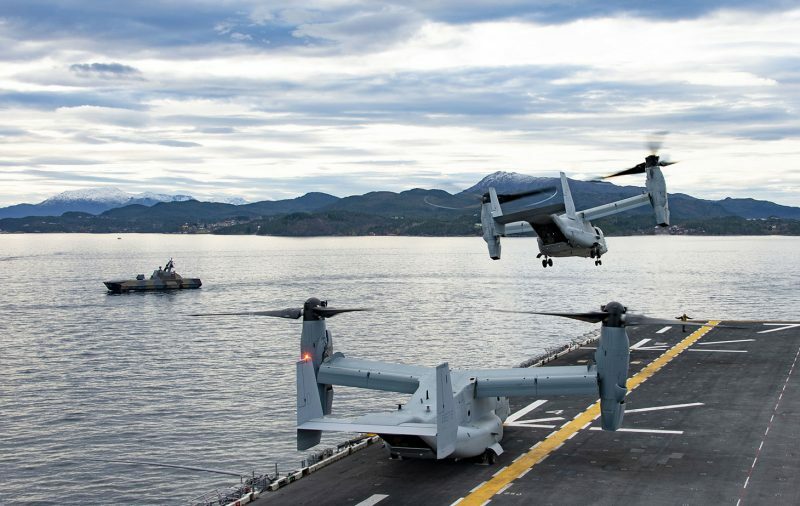 An MV-22B Osprey takes off from USS Iwo Jima (LHD 7) while the Royal Norwegian Navy Skjold Class fast patrol boat HNoMS Storm, left, patrols the Alvund Fjord during exercise Trident Juncture 2018. Photo: US Navy. What has Europe’s response been? At a secret meeting of the Political and Security Committee in Brussels, French and German diplomats opposed any action against Russia, even soft action such as increasing EU sanctions. Elsewhere, Eurocrats came to the weird decision to eject the UK from the Galileo project (a pan European GPS system where UK has developed nearly £1bn or over 10 per cent of the value of the project). The pretended reason is security; the real reason is the same for the EDF and for PESCO. France and Germany want the lion’s share of the business. UK representatives have already been banned from discussions and exchanges pertaining to the post-2019 development of the security aspects of the satellite system. Both France and Germany will, regardless of Brexit, have cause in years to come to thank both the UK and the USA. They are likely to remain the primary guarantors of security on the high seas via NATO, especially in the Arctic where, as a report from the Human Security Centre (HSC) think-tank has pointed out, there is a growing naval threat from Russia. Never mind the Sea of Azov, Russia means to make the roof of the world its mare nostrum. Northern and Western Europe better watch out.